New information has demonstrated that there are few long-term disease-free survivors after a liver transplant for neuroendocrine tumors. All studies have limited follow-up to 10 years after a transplant. We present the case of a recurrent metastatic carcinoid in a patient 16 years after an orthotopic liver transplant. The subject initially presented with worsening chronic diarrhea, hypoglycemia, and confusion with massive hepatomegaly. The postoperative pathology report showed 80% to 90% of the liver tissue replaced by biopsy-proven synaptophysin-positive intrahepatic tumor with neuroendocrine differentiation. At the time of his liver transplant, he also underwent a distal pancreatectomy and splenectomy. Nuclear medicine tumor location studies, ultrasound, and computed tomography studies were performed at regular yearly intervals for 8 years on follow-up. Sixteen years after his orthotopic liver transplant, a retroperitoneal mass was detected showing neuroendocrine differentiation. Older studies focusing on an orthotopic liver transplant for highlighted clinical features would positively predict long-term survival. Older studies found the following features to be predictive of long-term survival in liver transplant for neuroendocrine tumors: age < 55 years, < 50% replacement of liver with metastatic neoplastic tissue and carcinoid type. These features were identified on multiple studies as positive predictors of disease-free survival. These studies were limited to, at most, 10-year follow-up. Newer studies have examined molecular features such as expression of E-cadherin and Ki-67 as positive predictors of long-term survival. However, no study has determined the full natural history of these tumors and for how long these patients should be followed. This anecdotal report highlights that late recurrence can occur. Pancreatic neuroendocrine tumors (NET) include insulinomas, gastrinomas, glucagonomas, somato-statinomas, carcinoids, and VIPomas. Carcinoids originate from enterochromaffin cells and can either be functional or nonfunctional. Carcinoid syndrome develops in 7% to 10% of patients and in 35% to 50% of patients with liver metastases. Carcinoids are the most common primary small bowel lesion beyond the ligament of Treitz, with 90% originating in the distal ileum. Metastases can be found in almost 80% of pancreatic NET at the time of diagnosis. Liver metastases develop in 46% to 93% of patients with NET. Prognostic factors for metastatic potential include histologic grade, tumor differentiation, and tumor stage. Proliferative indices include number of mitosis and Ki-67 staining, which can be divided into 3 classes (G1, G2, and G3): G1 requires < 2 mitosis/10 high-power fields and < 2% Ki-67 staining; G2 has 2 to 20 mitosis/10 high-power fields and 3% to 20% Ki-67 staining; and G3 > 20 mitosis/10 high-power fields and > 20% Ki-67 staining. Despite these predictors for metastatic spread, determining the overall survival is based on TNM stage. Chemotherapy is associated with response rates of 15% to 56%, limited progression-free survival with a median of 4 to 5 months and all-cause survival of 15 to 26 months. Medical therapy alone is not an appealing option for definitive treatment. Surgical therapy has better rates of disease-free and all-cause survival. Recurrence is not uncommon for primarily resected disease already metastatic to the liver. Despite this, survival is not affected by recurrence. While curative resection is only possible in 20% of cases, symptomology can be greatly improved with reduction of the tumor burden to the liver. Therefore, a more definitive option is needed for treatment. Orthotopic liver transplant is considered in patients with neuroendocrine tumors with metastases limited to the liver and not amenable to curative or cytoreductive surgery, those who do not respond to medical management, and in tumors with life-threatening symptoms.4 Orthotopic liver transplant to treat and cure metastatic neuroendocrine tumors has been well documented. 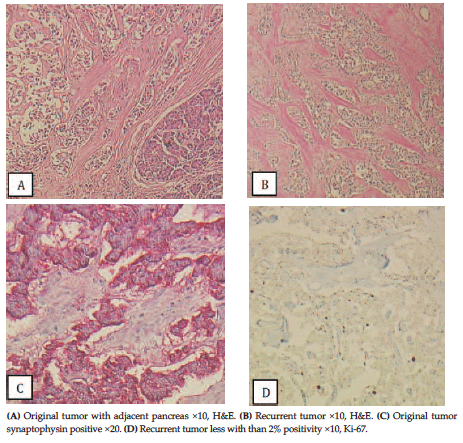 Overall, 1-, 3-, and 5-year survival ranges from 71%, 55%, and 44%.5,6 Positive predictors of long-term survival after orthotopic liver transplant include intestinal location, lack of hepatomegaly, and carcinoid tumor-type features.7 Low level staining of Ki-67 and E-cadherin are associated with cure after orthotopic liver transplant, while low level staining with p-53 had no positive or negative predictive value.8 Screening for recurrence usually includes metaiodobenzylguanidine scanning, computed tomographic scans, and blood tests performed yearly. Most reports are limited to 5-year follow-up. Patients are usually considered “cured” if there is no recurrence of disease at 5 years. Frequently, screening is stopped. We report a case of carcinoid recurrence 16 years after orthotopic liver transplant for carcinoid metastatic to the liver. A 46-year-old African American man presented with 5 month’s duration of worsening diarrhea, hypoglycemia, weight loss, confusion, and massive hepatomegaly. A liver biopsy showed 80% to 90% replaced with synaptophysin-positive metastatic intra-hepatic tumor of neuroendocrine differentiation. He became encephalopathic and comatose after chemotherapy with fluorouracil, interferon, and streptozocin. He received a crossmatch negative liver in an uneventful operation that included resection of the primary pancreatic tumor. The explanted native liver showed metastatic pancreatic endocrine tumor. The distal pancreas and spleen were resected revealing a pancreatic endocrine neoplasm extending focally to the surface of the pancreas. Metastatic tumor was seen in the peripancreatic and splenic hilar lymph nodes. The spleen was unremarkable. The mitotic rate was low, less than 2 mitosis per 10 high-power fields and Ki-67 is also low, less than 2%. The transplanted liver displayed primary nonfunction. On postoperative day 3, he received a deceased-donor liver, which demonstrated primary nonfunction. On postoperative day 6, after the initial operation, the patient underwent plasmapheresis and a third liver transplant. His liver functioned immediately. He was discharged postoperative day 32. He underwent fastidious follow-up to confirm disease-free status. From the immediate postoperative period through year 8, multiple chest radiographs demonstrated no active disease of the chest. The results of an ultrasound of the abdomen/pelvis and liver/visceral duplex showed no lesions; contrast-enhanced computed tomographic scans were largely unremarkable, and nuclear medicine tumor location octreotide studies were normal. During his 11th postoperative year, transjugular biopsies (under computed tomographic guidance) for elevated liver function test results were done on 2 occasions, showing no malignancy. At postoperative year 16, he underwent a sonographic examination of the abdomen for abnormal liver function test results. A circumscribed, solid, hypoechoic, heterogeneous mass measuring 5.3 cm in its greatest dimension and accompanying mass effect was detected medial to the left kidney, in the left para-aortic compartment of the retro-peritoneum, suspicious for a metastatic lymphnode. A contrast-enhanced computed tomography confirmed this ultrasound finding and detected a smaller mass, 3.7 × 5.2 × 3.6 cm, in the region between the porta hepatis and the vena cava with similar density and appearance to the first mass (Figure 1). A liver biopsy performed under sonographic guidance showed no evidence of pathology. However, a computed tomography-guided core biopsy and fine needle aspiration of the left retroperitoneal mass that showed the morphology of the tumor was similar to the primary one and was positive for CD 56 and synaptophysin. Ki-67 was less than 2%, and p53 was negative (Figure 2). Three foci of increased radiotracer uptake in the abdomen were identified in an octreotide scan (Figure 3). A new punctate lesion in the lower thoracic vertebra was noted to have increased radiotracer uptake and thought to represent early metastases. This was later disproven with a magnetic resonance image of the thoracic spine. Four months later, the patient was medically optimized and taken for resection of the 2 lesions. The left renal mass was found to be intimately associated with the renal artery and vein requiring meticulous dissection. This mass had its own extensive blood supply, making the dissection difficult and time consuming. The right-sided mass involved the pancreas and vena cava. Both were completely excised (Figure 4). The patient’s postoperative course was complicated by hyperglycemia that was eventually controlled with an insulin pump. He was discharged home after 5 days. The masses were diagnosed as metastatic neuroendocrine carcinoma, also with focal Ki-67 positivity, and p53 was negative (Figure 2). Further imaging studies after 6 month were unremarkable. Lehnert and associates9 identified 2 common factors predicting poor prognosis; age > 50 years, and significant liver involvement requiring multivisceral resection either by a Whipple procedure or an upper abdominal exenteration. This study was not a meta-analysis, but instead, sampled cases from the literature without standardizing for length of follow-up and other factors. Le Truet and associates analyzed 85 multicenter case reports from 1989 to 2005.7 They found postoperative mortality after liver transplant and removal of the primary tumor was 47% with a maximum of 10 years’ follow-up. The factors predicting poor prognosis include tumor in the duodenum or pancreas, hepatomegaly, and gastrin secretion. They did not conclude age over 50 or percentage of liver involvement as independent risk factors. However, age > 55 years and liver involvement > 50% were statistically significant factors of a poor prognosis. The mean follow-up time was 46 ± 47 months. Bonaccorsi-Riani and associates reviewed 9 cases of liver transplant for metastatic carcinoid tumor to the liver between 1984 and 2007.11 They found 1-, 3-, and 5-year patient survival rates of 88%, 77%, and 33% with disease-free survival of 67%, 33%, and 11%. The longest surviving patient from this case series was alive at 96 months. However, the disease-free survival rates were poor. Five patients died from disease recurrence, all within 5 years, and only 3 patients survived longer than 5 years. This study also examined levels of Ki-67, synaptophysin, chromogranin, and CK 19 in all of their patients. However, conclusions from their examinations of comparative molecular markers and prognostic factors are not yet available. Rosenau and associates8 further examined molecular prognostic indicators, specifically, the effects of different levels of Ki-67, E-cadherin, and p53 expression in the metastases of neuroendocrine tumors. They reviewed their experience with 19 patients who underwent liver transplant for unresectable liver disease. Six patients died during the follow-up. These patients were followed up to 12 years; however, the mean duration of follow-up was 59 months. They found overall survival rates at 1, 5, and 10 years to be 89%, 80%, and 50%, while recurrence-free survival at 1, 5, and 10 years was 56%, 21%, and 21%. Survival in the 5 patients with low levels of Ki-67 and E-cadherin were significantly better compared with the 12 patients with higher levels, with 7-year survival rates of 100% vs 0%. Their data show a positive predictive value in levels of Ki-67 and E-cadherin, but that p-53 levels were neither positive or negative prognostic factors. Gedaly and associates, retrospectively analyzed patients undergoing liver transplant for metastatic NET in the United Network for Organ Sharing database.12 One hundred fifty cases were reviewed and showed overall 1-, 3-, and 5-year survival rates of 81%, 65%, and 49%. Their follow-up was up to 60 months for surviving patients. In addition, they found that patients receiving multivisceral transplants had the same overall mortality as single-organ transplant patients. This analysis did not find that age under 55 years or carcinoid versus noncarcinoid to be statistically significant predictors of improved survival after transplant. This study showed tumor resection is the primary treatment option, but that transplant for nonresectable disease is an acceptable alternative. They identified ideal patients as those with stable disease who had a MELD score upgrade as the patients who benefitted most from transplant. Research has focused on identifying patients who will be cured by orthotopic liver transplant. The French experience focused on macroscopic factors that could predict survival. They identified patient age at diagnosis, percentage of liver replaced by tumor, and carcinoid as opposed to NET as positive predictors of cure. Their results, however, have not been duplicated in other studies. The focus shifted to microscopic features of the disease, such as Ki-67 and E-cadherin levels. Investigators have found that lower levels of staining from metastatic lesions indicated better prognosis. Yet these studies had limited follow-up and did not follow patients longer than 5 years. In our case, this patient had low levels of Ki-67 and still had recurrent disease. This indicates that although he reached 10-year survival, he did not achieve cure. Our patient fits into the ideal model of a patient who should have been cured by liver transplant. He failed initial medical management with chemotherapy, which resulted in severe adverse events. He then underwent primary resection of his tumor concurrent with his liver transplant, the ideal method for cure described in the literature. His Ki-67 was less than 2%, and his index of mitotic markers was low, 2 features identified as predictors of cure by liver transplant. His tumor type also was favorable for cure after transplant. Based on presumed predictive factors, he should have remained disease free. However, he had disease recurrence at year 16, showing that 10-year survival does not correlate with disease-free cure. Our patient then underwent postrecurrence resection resulting in complete cure at 6 months and was started on octreotide. This is the first reported case of postrecurrence and transplant resection for cure of metastatic carcinoid. It is important to note that resection is a good option in this case. While this case report does not provide a definitive guide to the appropriate length of monitoring or what should define cure in patients with carcinoid tumor metastatic to the liver, it should act as a reminder. While patients may have improved symptoms, we do not know whether these patients are cured. It can be concluded from the current evidence that following these patients for only 10 years is insufficient. Surveillance should continue even after the 5- and 10-year disease-free survival benchmarks are reached, especially in a patient with poor prognostic indicators. Moreover, whether these patients should be transplanted at all is in question. As the data show, despite resection of visible liver metastases, these patients will recur with either tumor or other metastasis. Survival rates remain high, and as long as symptomology can be controlled, these patients are afforded years of survival even without transplant. We believe that the goal of achieving permanent cure is unlikely, but still makes case-by-case assessment of benefit for transplant necessary. In conclusion, treatment algorithms should begin with primary resection if possible, then progress to transplant if primary resection is not feasible. A United Network for Organ Sharing study showed that even multiple organ involvement requiring multivisceral transplant is a successful strategy in treating intractable symptoms. Our patient had recurrence of his carcinoid after 16 years and we resected his areas of recurrence. We chose this treatment based on the reports that primary resection of these tumors, even with multivisceral involvement, do well after treatment. We have described a patient who should have achieved long-term cure from primary resection and concurrent liver transplant, yet recurred 16 years after transplant. Based on available data, he should have been cured. We also described our treatment for recurrence in this patient, involving resection of the primary lesions. He has remained disease-free to this point 6 months after resection of the recurrence. Vogl TJ, Naguib NN, Zangos S, Eichler K, Hedayati A, Nour-Eldin NE. Liver metastases of neuroendocrine carcinomas: interventional treatment via transarterial embolization, chemoembolization and thermal ablation. Eur J Radiol. 2009;72(3):517-528. Fjällskog ML, Granberg DP, Welin SL, et al. Treatment with cisplatin and etoposide in patients with neuroendocrine tumors. Cancer. 2001;92(5):1101-1107. Coppa J, Pulvirenti A, Schiavo M, et al. Resection versus transplantation for liver metastases from neuroendocrine tumors. Transplant Proc. 2001;33(1-2):1537-1539. Blonski WC, Reddy KR, Shaked A, Siegelman E, Metz DC. Liver transplantation for metastatic neuroendocrine tumor: a case report and review of the literature. World J Gastroenterol. 2005;11(48):7676-7683. Máthé Z, Tagkalos E, Paul A, et al. Liver transplantation for hepatic metastases of neuroendocrine pancreatic tumors: a survival-based analysis. Transplantation. 2011;91(5):575-582. Bechstein WO, Neuhaus P. Liver transplantation for hepatic metastases of neuroendocrine tumors. Ann N Y Acad Sci. 1994;733:507-514. Le Treut YP, Grégoire E, Belghiti J, et al. Predictors of long-term survival after liver transplantation for metastatic endocrine tumors: an 85-case French multicentric report. Am J Transplant. 2008;8(6):1205-1213. Rosenau J, Bahr MJ, von Wasielewski R, et al. Ki67, E-cadherin, and p53 as prognostic indicators of long-term outcome after liver transplantation for metastatic neuroendocrine tumors. Transplantation. 2002;73(3):386-394. Lehnert T. Liver transplantation for metastatic neuroendocrine carcinoma: an analysis of 103 patients. Transplantation. 1998;66(10):1307-1312. Florman S, Toure B, Kim L, et al. Liver transplantation for neuroendocrine tumors. J Gastrointest Surg. 2004;8(2):208-212. Bonaccorsi-Riani E, Apestegui C, Jouret-Mourin A, et al. Liver transplantation and neuroendocrine tumors: lessons from a single centre experience and from the literature review. Transpl Int. 2010;23(7):668-678. Gedaly R, Daily MF, Davenport D, et al. Liver transplantation for the treatment of liver metastases from neuroendocrine tumors: an analysis of the UNOS database. Arch Surg. 2011;146(8):953-958. Acknowledgements: This study was not funded, and the authors report that they have no conflicts of interest.